Let's jump back shortly and see what an enol looks like. An enol is an organic species showing an hydroxyl group (−OH) and a double bond (C=C) at the same carbon, in other words the carbon carrying the hydroxyl group is involved in the double bond. The name "enol" results from the sum of the two functional group, en (from alkene) and ol (hydroxyl group). Treating with a strong base the enol we can generate an anion called enolate, that is the conjugate base of the enol, for which is possible to write two resonance structures well representing the delocalization of the negative charge. As you can see, on one of this structures the negative charge is on the enol carbon, that is therefore, at least partially, a carbanion, a nucleophilic carbon. If we considered the Hard - Soft theory, we have an hard nucleophile when the enolate reacts at oxygen (electrostatic control) and a soft nucleophile when it reacts at carbon (orbital control). Anyway, in the present article we're going to consider different aspects. Of the two structures without any doubt the one that more describes the hybride is the one with the negative charge on oxygen, because heteroatoms (O,S,N) stand better the charge than carbon (just think to how it is difficult to deprotonate alkanes) and are therefore lower energy structures. Anyway, the carbanion form as well, though less, contribute to the description of the hybride, and it's particularly important because many reactions at that carbon are of great interest (in general, they allow to build C-C bonds, and therefore even complex carbon skeletons) . 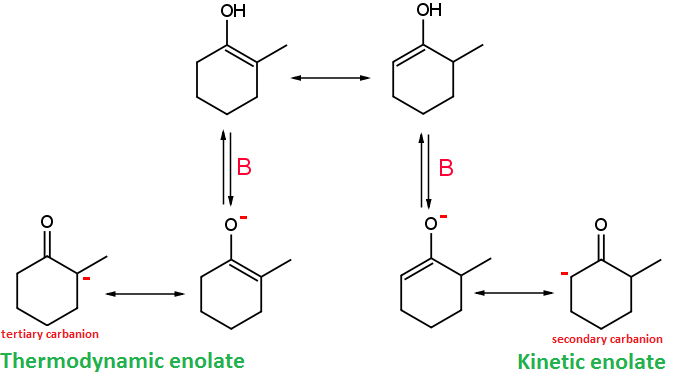 When enols show different substituents adjacent to the double bond deprotonating with a base can lead to the formation of different enolates. 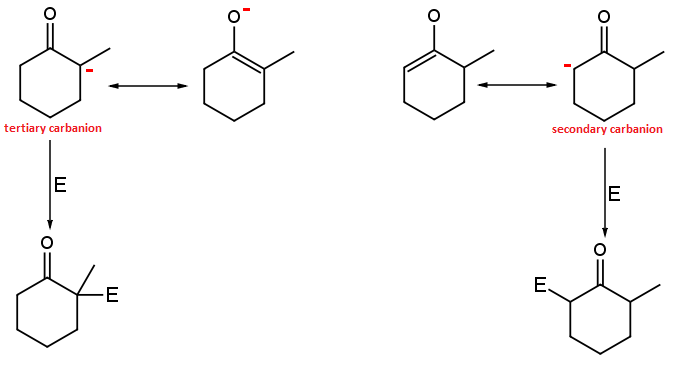 For example, which enolate would we obtain from 2-methyl cyclohexanone? There are actually three possible resonance structures, and therefore all three the species have to be present in solution (the equilibrium though is still shifted to the keton form). The experience suggests us that more substituted alkenes are more stable for thermodynamic reasons (Zaytsev's rule). Then the enol on the left, whose double bond has four substituents different from hydrogen is thermodynamically more stable. If we put the 2-methyl cyclohexanone the keton most of the product would remain in the keton form, while between the two enols the one on the left would be more concentrated. We've to pay particular attention, because it's extremely easy to mess. Tertiary carbanion is more stable than secondary carbanion. Tertiary carbanion comes from the more stable enol (more substituted), while the secondary carbanion comes from the less stable enol (less substituted). The situation is the opposite for their deprotonation products. What can we therefore expect if we add an electrophile to the solution? Which product would form? Left or right? It seems to be a dilemma. On one side we have the most stable enol giving the least stable enolate, on the other we have the least stable enol giving the most stable enolate. Who react first with the electrophile? It's convenient to approach the question from an acid-base point of view. First of all, which enol is more acidic? In general, if we have to compare the acidity of two molecules, basically we've to comparte the stability of the resulting anion. Now, the most stable anion is the secondary carbanion, then the more acidic enol is the one corresponding to the less substituted alkene. Why are we talking around acid-base properties? Acid-base reactions are the class of reaction having the fastest kinetic. In the end the answer is that, in normal reaction condition, therefore basic environment and low temperatures, the product which forms more quicly is the kinetic product, that is the enolate who comes from the more acid enol. That's all about acid-base reactions kinetic. How could I synthesize the thermodynamic enolate? That's all question of activation energy. If I give the reagents enough energy to overcome the reaction activation barrier then will always form the more stable product. How can I provide reagents energy? The easiest way is to raise the temperature. Who needs more energy? The base, because it needs more energy to deprotonate the less acidic enol. Sometimes can be useful to direct the synthesis towards the thermodynamic product, and Mukaiyama reaction is a good example. If I provide enough energy the termodynamic product will always form. In general, operating at high temperature will lead to the thermodynamic product and that's generally true. The temperature is usually used to put under kinetic control the reaction. Opportunely modifying conditions and temperature in particular allows to direct the reaction towards the kinetic product, the product who forms faster. And what's faster than an acid-base reaction? That's why where we pointed B in the example we would had probably better say something like LDA / -78°C.